Just gonna note down whatever useful stuff people have found out about this update. It’ll include info on new gear and Dark Blasts in particular. If any new info is dug up later I’ll probably add it to this post. These new collection files are primarily progressed through Buster Quests. You can only earn credit for Omega Hunar’s part through the Endless Belligerence Emergency Quest, which for now is also the only place in the game he spawns anyway. Its SAF is Modulator, so even if you don’t plan on actually using these weapons it may be worth grabbing the files just for some useful fodder items down the road. The potential works a little bit like the old Ares one in that its power scales based on your Dark Blast gauge (instead of Photon Blast). It also boosts the rate at which you build your Dark Blast gauge and increases the amount of time you can use it for. Lv1: Increases damage depending on your Dark Blast gauge (up to 15%), increases Dark Blast gauge accumulation rate by 10% and increases transformation time by 5 seconds. Lv2: Increases damage depending on your Dark Blast gauge (up to 16%), increases Dark Blast gauge accumulation rate by 15% and increases transformation time by 6 seconds. Lv3: Increases damage depending on your Dark Blast gauge (up to 17%), increases Dark Blast gauge accumulation rate by 20% and increases transformation time by 7 seconds. It seems that the damage bonus will persist after you’ve activated Dark Blast, which considering it’s not far behind Qliphad in terms of attack power actually makes these fairly decent weapons as at full power they have a 17% damage mod versus Qliphad’s 14%. Does it persist through weapon swap? Does it persist through area change? If the answer to both of these is yes then these are actually good weapons even if they do take some warming up to get to full power. Outside of low-attack weapons these ought to be competitive with Clifford weapons in overall performance (at max power, of course). For now it only covers a few weapon types, but it feels like a safe bet that we will be getting other Dark Blast types at a later point. The weapons released so far are based on the current Dark Blast (Elder type) in appearance, so the others may be based on their respective Falz types as well. There are 18 weapon types in the game, so 13 more to cover which could easily be spread out among the remaining three Falz types. 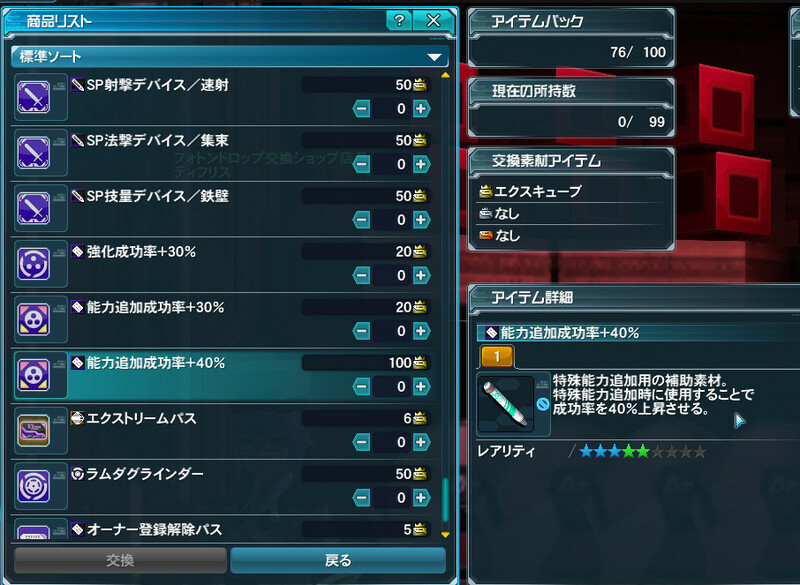 A brand new weapon that has a low chance of dropping from Advance Quests included in the current Arks Boost Road (which is Skyscape, Ruins and Facility). It’s essentially the Twin Machinegun version of Altacray, complete with the same Hero-focused potential. Considering it has slightly more attack than Qliphad, this is a pretty powerful weapon if you’re able to pull off a lot of Hero counters in a given fight. Its SAF is Spirita VI (+7 PP), the same as Altacray. The brand new 14-star sword which you’ll probably never see. However, unlike Elder Pain in its day, which was more a gimmick than anything, this weapon is actually solidly practical. Also, unlike Elder Pain, you don’t need to break Omega Hunar’s sword to get a chance of it dropping. Its Special Ability Factor is Ability IV, like the other 14*s so far. Its potential is the classic Vampiric Blade, which recovers 4/5/6% of damage dealt in health. That alone isn’t what makes it practical; it’s the massive 2,201 S-atk the weapon boasts at +35! This is 221 attack higher than Demonia Saber and 224 higher than Akatsuki, the other 14-star swords. Now the thing with S-atk that high on a weapon is it benefits from elemental bonuses much more than lower attack weapons. For example, Qliphad Calibur at 60% element gains an additional effective 997 S-atk before applying modifiers (element only includes base attack, it doesn’t include affixes so Antithesis Trainer has no effect here) where as Omega gains a whopping 1320. Below is a chart made with the damage calculator (with credit to RoboArks for the original chart. I’m trusting their numbers on this as it worked out similarly to calculations done by a friend). So it slightly beats out Qliphad but also has the benefit of making you near immortal while using it. I’d call that a practical weapon! So unless you’re lucky enough to be sporting a Demonia or Akatsuki then Elder Pain: Omega is definitely worth using if you manage to get one. A few old weapons gained Weaponoid potentials with this update; Ideal Scissors, Astral Riser NT and Avenger NT. Remember Ideal weapons? I do, I have fond memories of Challenge Mode at its prime. Anyway, the new potential makes it a sort of decent weapon if you don’t have a Zeinesis or Qliphad but it’s weaker than them overall mostly due to Ideal weapons having the lowest attack power of all 13*s. The damage comparison works out to something like this (with thanks to NextTime000 for running these numbers). So it’s helpful if you don’t have a 13* Wired Lance already and have the weaponoid stones to spare. Not at all convinced by this potential, seems kind of garbage. This potential is sort of curious but perhaps not that useful on a Rifle. For the most part, Rifles tend to hit weak-points on enemies but I mean if you’re against enemies that don’t have weak-points and you also don’t have Weak-bullet loaded that is an awfully meaty damage boost (since the rebalance, a weakbulleted hitbox counts as a weak point regardless of the resulting damage modifier). It just might be too awkward to satisfy its condition with this particular weapon type. Incidentally, Avenger NT is the only new weapon out of this batch and much like Yamigarasu NT its Special Ability Factor is Soul Receptor. So even if you don’t plan on using it, it might be worth getting to help with affixing future weapons. Increases power and PP recovery for every successful Just-Guard. Bonus is lost when you take any damage. An interesting potential mechanically but one that has to be maintained actively. On the plus side, if the enemy has lots of multi-hitting attacks you could actually max this potential out quickly though Charge Parry as each hit counts as a Just-Guard. Overall, due to Bluesy NT’s low base attack even if you keep the potential up this weapon is a little wimpy compared to other options. Like Avenger NT, its Special Ability Factor is Soul Receptor. I’m not going to make a comprehensive guide on Dark Blasts as you can already find that over on Bumped here, but I can go over some quirks about it that might not be immediately obvious. It functions essentially like Nanoblasts did in Phantasy Star Universe, only anyone can use them and you’re limited to using it only once per quest. Unlike Nanoblasts however, if you’re defeated while transformed you just lose the transformation instead of dying. To unlock it for your characters, either clear Episode 5 Chapter 2 or clear the Endless Belligerence quest on Super Hard or above at least once. This unlocks it for your account. Dark Blasts gain a portion of your EXP in a similar way that Skill Rings do. They will only gain EXP from enemy kills which is totaled up and added to your Dark Blast’s total EXP at the end of a quest. As such, don’t bother chugging EXP tickets. The proportion of your EXP gained depends largely on what enemies you’re killing. It’s 10% for most enemies in the game while it’s 30% from Aquatic Darkers (of all types, aside Phantom), Dark Falz and any enemy in Buster Quests taking place in the Verun Empire. This means aside catching Endless Belligerence or any Falz raid the most effective way to level up this particular Dark Blast is by hitting up the Ruins Advance Quest on either difficulty. So how do you progress the gauge? The short of it is “no one seems to know”. The gauge seems to have a different rule set to the likes of Compounds, Hero Gear and Photon Blasts. As far as is known, it’s based on the amount of damage you do to enemies (but it may not be relative to their max HP as is the case with other gauges like this). It also seems like there’s a timer that has to expire before you’re allowed to make progress, as often you might see your Photon Blast is full before your Dark Blast even has its first bar. Ultimately, this gauge isn’t actually that well understood for now. Hopefully it’s worked out soon and I’ll replace this section when we know for sure how it works. Exp you earn will go into an account-wide EXP pool. Note that this the total amount of EXP that each of your characters gets to spend on their respective Dark Blast skill trees, so you won’t have to earn more to cover your alts. The displayed amount of EXP in the Dark Blast skill menu is that particular character’s unspent EXP, not your total. You’ll need a total of 225,555,190 Exp in order to max out every Dark Blast skill, which works out to earning 2.25Bn-751M real exp from enemies and quest clears depending on which enemies you kill. Swiki works this out to be the equivalent of getting 9 classes to lv80 + another class to lv34 to 27 classes to lv80 and one class to level 65. Considering there’s a chance that other Dark Blast types might be released in the future these seem pretty darn insane requirements, but at least they had the mercy to make this account-wide. It’s nifty but it feels kind of weak compared to my regular attacks, at least in the early levels. Between that and only having a minute every quest to learn how to play it has made exploring this feature awkward. It gets some crazy air with its double-jump however and between its jump-kick and Physical Dash it can cover an enormous amount of ground quickly. My early impressions are that Tyrant Strike is your gap-closer with pretty respectable AoE to boot. Infinity Rush is for wailing on single targets, like bosses and raidboss weakpoints (particularly if they’re static as its DPS raises over time). Punishment Knuckle is a pretty good frontal AoE attack useful for dealing heavy damage to piles of enemies at once. So I mean, in terms of Photon Arts it covers what it needs to and as its Photon Arts keep you airborne combined with its incredible jumping power aerial targets shouldn’t be an issue either. One thing to be aware of is even though it has a lot of HP, Dark Blast: Elder is surprisingly fragile, with a meager amount of defense stats. It really can’t take a lot of punishment, so be wary about going gun-ho against particularly dangerous enemy attacks (such as Omega Hunar’s ground slam attacks) and from going too deep into a pile of enemies. As I said earlier, it seems pretty obvious to me that they’re going to release additional transformation types in the future. We have 4 Falz types afterall, the 4 kingdoms of Omega are all based on the different Falz types and so much of the current Dark Blast’s aesthetics, moves and mechanics are based on one of the Falzes. That said, there’s been no official confirmation that that’s the plan and so far all we’ve had is that Dark Blast colours will be customizable at a later date. There’s also nothing in the data that supports additional blast types yet, aside inferring it via the internal name specifically referencing Elder. Whatever their plans are, they’re keeping their lips sealed for now so we can only speculate. All I’m gonna do in this post is collect data related to new content that arrived with this update. A lot of this data is still being discovered, so expect the post to change in the coming days and possibly weeks. The raid functions much like the Yamato raid; you’ll need to carve your way through a large pile of regular enemies before you get to the big boss itself. You’ll also come up against two different forms of Deus Hunas along the way. I’m just gonna summarise what happens at each part of the raid; this isn’t a guide for the best tactics to defeat him quickly. Beware of his lightning attack; it functions much like Falz Hunar’s ground slam in that it spawns multiple projectiles at once. If you’re in the center of them, unless you time a dodge or guard well you\ll be instantly incapacitated. He doesn’t have a lot of HP so this part should be over quickly. Not much to say about this section. Don’t run into the vines and kill anything that stands in your way. It’s Hunas again but with a hat and a new selection of attacks. Most of them aren’t terribly noteworthy though, so just hit him until a cutscene plays. One attack to watch for is when he teleports into the center of the arena. The ground will start glowing; you’ll want to move to an area of the arena that isn’t glowing! These are typically at the edges closest or furthest away from him but the attack is also fairly easy to dodge with a step or mirage or any abusable i-frames. Damage snake-heads until their heads are covered in bramble at which point they’re immune to damage. Once all heads are immune to damage, they’ll begin charging an orb. Attack the orbs to stun the heads. Once all heads are stunned, you can jump onto them and traverse them to attack Deus Esca’s core. Beware, once Deus Esca recovers he’ll split the arena in two; if you’re near the attack use i-frames or you’ll take around 3000 damage. If you see Deus Esca holding hiw weapon up like this don’t be where the idiot pictured is standing. In this phase Deus Esca will start to use more aggressive attacks on the arena itself. However his core is permanently exposed, so attack it whenever he’s between attacks. Deus Esca will blow up the moon, which is rather rude of him. This signals the final part of the raid which starts a 5-minute countdown. This is a DPS check; you\ll need to defeat Zephyros before this timer expires or else you’ll immediately fail! Break the snake heads first to make him use attacks similar to the 2nd phase, then hit his core as hard as you can when you can to bring this god to its knees. At some point you’ll deal enough damage to make the boss pass out on the arena. This is actually a secondary DPS race in that you’ll need to defeat the boss before it gets up again or else it’ll use a move that kills everyone in the MPA. Clearing the raid gives you shots at 14* weapons, a 13* Rappy and any Zeinesis item. For the most part though you’ll be getting Nox weapons and 10* trash. The S-Atk factor finally arrives. It’s otherwise exactly the same as the other two factors. It provides 20 S-atk, 10 R-atk, 10 T-atk, 20 HP and 1 PP. The difference between Zeinesis and Qliphad weapons is entirely cosmetic. You will need 120 Qliphad Fuses and the corresponding Zeinesis weapon in order to obtain a Qliphad weapon. Like the Ray series update, the weapon retains its grind, element, potential level and affixes. Unlike the Ray upgrade however, it seems the weapon will force you into the Qliphad potential when you upgrade. The names here are not translations of the actual affix names, just placeholders. Only applies to this weapon, not if it’s an ingredient item. The timer for the heal starts on area change. The attack boost is like a small, passive Shifta that applies as soon as you enter an area and re-applies every 30s. Note that it’s like a Shifta buff, so its only raising your base attack by 2% not the amount of damage you do. The heal ability will pulse for all party members, meaning if all 4 people have the potential you get a 10% heal 4 times. The attack boost is fixed, however. It’s always 2% regardless of how many people in your party have it. The attack buff persists even if you swap weapon. 14% Damage bonus and doubles the stats of your affixes. This seems to include most kinds of affixes, including HP, PP and Resists. It’s not known if it affects things like Phrase. The “Qliphad potential” potential requires 120 Qliphad fuses in order to unlock. I’m not sure which of the three this is at the moment. Zeinesis’ Special Ability Factor is “Sentence Triple”. It boosts all attack stats by 30, so it’s essentially equivalent to Modulator and can of course be stacked with it. It presumably cannot be stacked with other Sentence abilities. Unlike weapons, there are in fact differences beyond the cosmetic. Qliphad units will require 60 Qliphad fuses each as well as the corresponding Zeinesis unit. For the other way round, you only need the corresponding Qliphad unit. So it seems that Zeinesis units are more defense oriented where Qliphad offers more PP. The values for Qliphad likely aren’t going to be known for a few days as people collect enough Qliphad Fuses. There does not appear to be a set bonus. There’s very little information about them currently, as very few people have been lucky enough to obtain one then go on to share data about them. As such it may be some time before we know the full capabilities of these weapons. To put it into perspective, there’s still some confusion about the Escafalz Mother 14*s and she came out a few months ago..
Boosts the power of normal attacks. Fires a shock-wave on the third part of the combo. During Alter Ego, your Pet’s Sympathy requests are automatically fulfilled. A fairly handy innate ability, as you won’t need to interrupt your own attacks or lose PP to heal/buff your pet when it requests it. We also know from the trailer the staff will auto-cast Megid whenever you issue commands to your pet. A double saber that turns DS whirlwinds into firey tornadoes. DS Whirlwind is already how Double Sabers do a heck of a lot of damage (thanks to the DS Whirlwind Skill Ring) so the fact it boosts the power and duration of those is already enough to make this a potentially seriously powerful weapon. We’ll know for sure once the potential’s numbers have been worked out. As the subtitle suggests, Episode 4 has gained its own version of Astral Soul. What’s more is it could stack with Astral Soul making for some potentially obscene affix loadouts. The affix is named “Ether Factor” and it boosts all stats by 30, HP by 10 and PP by 6. So suddenly the likes of Yamato Factor become relevant again. Ether Soul shouldn’t be a problem as those souls are readily available; but supply of the factors will only occur when the relevant raid is up. While you could combine it with Astral Soul it won’t be easy, however having both would give you 65 in all stats as well as 45 HP and 11 PP. That’s pretty nuts for just 2 affixes! Obscenely good for 4 slots but err… good luck! The ultimate all-rounder unit. Or you could throw out the MutaII and put Stat V and Elegant Stat if you want to focus on one attack stat. This is so far into crazytown though I don’t want to contemplate it any.. This shop offers Grind Limit +1 items for specific weapon types. The exchange rate is one Weapon Specific Grind Limit +1 for 300 class cubes. Pretty nasty… You get 5 class cubes every level up at 80, which is 9.8M exp per. So each of these items costs 60 level up bonuses at lv80, or around 588M Exp per item. I’m speechless. A little more than a week into 2017 sees the addition of 2017 Weapons Badges and a brand new web-panel event. Just gonna go over some potentially useful data and share a couple thoughts here and there. Because some stuff is still being discovered some of the post contents might change over time. It’s your standard run about and kill monsters from various fields affair. The most interesting parts about the selection this time is it is for now the only reliable source of Esca Darkers in the game. The quest advances based on E-trial clears and ends on a titled Dark Falz Dourumble with either Giguru Gunnegam or Zeta Garanz. Unlike previous years, where you could get Weapon Badges from drops and Etrial clears this one only gives you them for clearing the quest. How many you get depends on your rank and the current difficulty. Extra Hard: 10 for S-rank, 8 for A-Rank. You’ll need to clear the quest within 15 minutes for an S-Rank. Like Riding Quests, all drops are pooled together into a crystal that spawns in the center of the map. You aren’t warped there however, you’ll have to get there by foot. Do not take the telepipes that spawn, because if someone breaks the crystal while you’re on the Campship you won’t get any drops at all! This actually has a negative effect when Emperappy shows up, as its drops end up having to compete with the rest of the drops which can potentially drastically reduce the number of Emperembrace items you’d normally get. It’s an alright enough quest it just really needed some additional polish to help it out. Like I don’t know why they didn’t just warp you to the drop crystal at the end like they do for Riding Quests. The quest is kind of easy with enemies like Anga Fundarge having severely reduced HP but the primary purpose of the quest is to grind out items for welfare weapons anyway so I didn’t expect the quest to be terribly difficult. They did seem to do a good enough job of covering as much ground as they could with run-boost rings and jump-pads to make the map as painless to navigate on foot as they could. I’m kinda glad they took this approach with the map, because I like that I get to run around and appreciate Vegas more than I could saddled up on a Rideroid. It’s been a little while, but that woman that stands around in the lobby wearing outfits from the future has returned. She has a brand new selection of utterly useless items. This year, there are no Silver Badges. They’ve done away with the latter tiers entirely which I don’t really fault them for. Fewer items taking up space in my inventory is appreciated. What’s curious is so far they haven’t added any kind of exchange to turn in older badges for 2017s. They also haven’t updated the Pyroxene exchange, which still offers 2016 badges in exchange for 100 of any Pyroxene. They also took Levelup Quests out of circulation, which means for now the only source of 2017 badges is the current Limited Quest. I guess they wanted attention focused entirely on the event quest, so all alternative ways of getting badges might be being put off til after it’s over. Boasting as much attack power as Ray weapons, these are fair sight behind the Astra series on offer from Escafalz Mother. They require 200 gold Weapon Badges each and come with 30% element. This means you’ll need 400 for each 60% weapon and 1200 if you want to +35 them. The question is of course, would you want to? Boosts power and chance to inflict status effects as well as deals extra damage to enemies suffering from status effects. 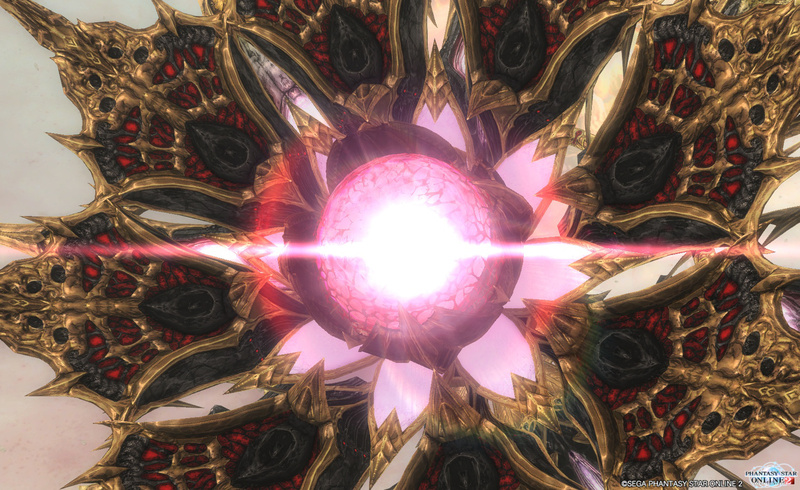 At lv3 it’s a 10% base power boost and an additional 10% if the enemy has an SE. Allegedly, it boosts the infliction rate of status effects by 70-75% which if true does potentially make Chase a more reliable skill while using these weapons. The power boosts are multiplicative, so if an enemy is suffering from a status effect the total damage bonus is 21% which is pretty solid! While a strong boost, it’s still a situational potential as it can only be used at its fullest against enemies that can have proper status effects inflicted on them which makes the potential worthless on every boss in the game! So it’s primarily going to be useful for mobbing (particularly on Ultimate) and against most mini-bosses. Assuming this works with techs, classes that have access to more status effects at once get better mileage out of them (classes that can use Techs really), where classes that have to rely on a status effect being affixed to the weapon might have to get one for each of them. The wand may be useful for those running Te/Fi who make use of Wand Gear Element and Chase Advance skills but aside that I can’t really see these being useful for anyone. Combined with their low-ish attack power Xie’s weapons kind of continue this trend of being kinda useless overall. What’s also a shame is the weapons have a kind of neat aesthetic to them. I kinda like them and once again I’m sad that there’s no mechanic in PSO2 that lets you take any weapon and turn it into a camo or else I’d grab a few weapons just for their skins. At +35 you’ll unlock Phrase Chase, which boosts the effectiveness of Chase Advance by 5%. So really much like similar Phrase SAFs it just boosts the effectiveness of the weapon potential. Unlike the others I’m not sure you’d want to transfer this to another weapon though. Xie offers two units at 50 gold each. Like the weapons, their usefulness is questionable. That said, they are 12* units so if for whatever reason you absolutely must have some budget units you can stick some Skill Rings into then I guess these are OK. This update saw the addition of quite a few Skill Rings. Adds a Just-Attack circle during a Step. This also works on Bouncer’s Mirage Step. The main use of a ring like this would be to reduce the amount of time before you can do a Just-Attack out of a dodge and in cases where doing a step into Just-Attack would be faster than doing a normal attack or some other ability into one. Still if it does shorten the time to a Just-Attack it’s a potentially extremely useful ring which has the added bonus of being usable at lv1. Increases the power and frequency of your Mag’s normal attacks. This has no effect on trigger or SP actions. Mag normal attacks do so little damage that even if the numbers work out 300% power and 50% cooldown at lv20 (effectively 6 times the damage output) it’s going to make no noticeable impact. This ring seems like a complete waste of space. Damages enemies around you when you pull off a successful Just Reversal. Unknown final numbers. 450% power and 160% range at lv13. This works with L / Air Reversal. Changes rod shoot to fire a slow moving projectile instead. This projectile will speed up and home in on a target after 1s. On contact with an enemy it explodes, dealing damage to all enemies in range. The hitbox seems to roughly match Launcher normal attacks in range at Lv1. Swiki notes that due to how slow the projectiles are, in an MPA most enemies may be dead before they get to do anything. As such, this ring may only be practical solo. Like the other Guard rings, reduces the likely-hood you’ll be inflicted with the specified status effect. Presumably to 100% at lv20 like the others but it hasn’t been confirmed. Useful but very situational. The specific status effect would have to be a significant enough threat to warrant wearing one over a more useful ring. Works the same way as Bouncer’s Critical Field. Creates a field around you, boosting yours and anyone else’s critical hit rate by a certain amount. Cannot be used by Bouncer main or sub. Could be helpful to classes that need the additional crit rate. Fighter/Hunter springs to mind, though they can also utilize the class rings for a permanent 10% crit rate boost. Works like Braver’s Quick Mate. Boosts the speed of using healing items. The effect stacks with L / Mate Lovers. If you want a build around extremely fast healing item use time the pair of rings could work well but honestly I feel like Mate Lovers does the job well enough on its own. Having both would be excessive in my opinion. Episode 3’s finale finally arrives with the showdown against Dark Falz: Double and the Profound Darkness. Let’s go over the quest briefly. This will not be a breakdown of tactics and mechanics, as its too early to make an exhaustive list of what the boss does to you and you can do to it. So instead it’s going to be more of an overview. 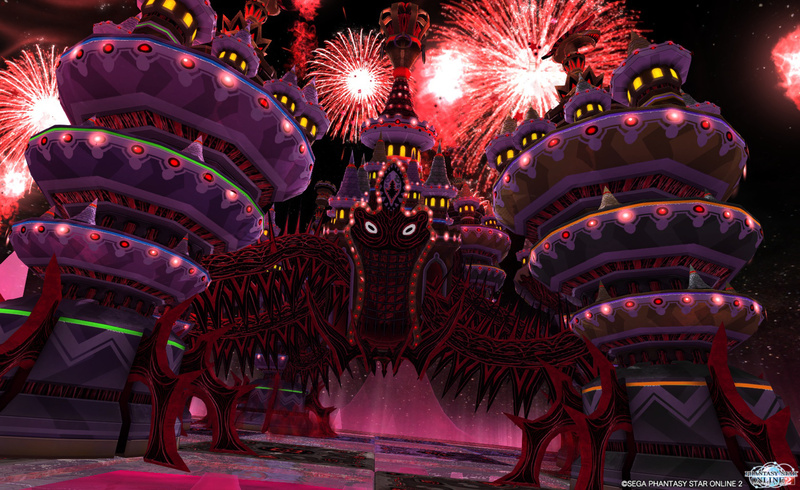 As was stated in promotional material, the quest works just like the “Utterly Profound” quest where players face off against Dark Falz Elder and Dark Falz Loser in succession. It’s slightly more complicated in its cutscenes and one quest directly leads into the other with Double’s arena shattering upon defeating it. Double’s attacks are fairly nippy for such a large boss, it’s also invulnerable everywhere apart from its weakspot attached to one of its “legs”. Melee classes might have issues keeping up with the weakspot due to how quickly it can move, where forces should have the easiest time with their tracking attacks. Beyond this, most of its attacks are well telegraphed enough that they shouldn’t really cause a problem for most players. Its wall and sweeping attacks can hit pretty hard, but it lacks a raid-wipe move like Falz Loser. Profound Darkness itself has at least 4 phases. Mechanically, there isn’t really a lot to the fight, as it throws attacks at you and you can throw attacks at it as long as it’s next to the arena. There’s no complicated order to things like there is with Dark Falz Loser or arguably even Magatsu. During phase 3 your raid will need to defeat some floating balls it sends into the arena however, as much like Anga’s bits destroying them all will stun the Profound Darkness, allowing you to freely DPS it. The part of the fight that I thought was the coolest was the part where players are separated into their own spaces and they have to challenge themselves. It’s much more than clone fight however, as your alternative self behaves much more like an enemy with its own unique movesets and abilities. This is seemingly Profound Darkness’s raid-wipe mechanic, as failure to deal enough damage to your alternative self will result in the Profound Darkness dealing massive damage to the entire raid. Once you pass this DPS check the boss is seemingly motionless until you defeat it. For both parts, Weak Bullet is significantly weaker than it is in the rest of the game. Instead of a 250% damage mod it’s around 120%, which is nice to have but it won’t make or break a multiparty (hooray!), . It really doesn’t matter much, as both bosses have much less HP than the other raid bosses meaning you won’t need to worry about your multiparty failing, especially as they give you an hour to complete it. You’re also given a stacking bonus to your stats (PP regeneration and HP at least) which all but trivialize an already easy but definitely cool fight. So what does Episode 3’s final boss give you? For the gear hunter in all of us, this is probably the most interesting part. That is to say it isn’t terribly interesting but whatever. Judging from posts by players and my own experience with the quest it seems to give roughly 6 Caligula stones on average, with a varying amount of Nero stones (I’ve seen reports of 0-2). Nero stones can drop from any Dark Falz and Dark Falz humanoid. This means Angel, Dourumble,Hunar and Apprentce Doppleganger can all drop them. While this is great, what isn’t known is what the drop rates on them will be. The jury’s out on this one, as people haven’t done enough runs to really establish how good or bad the rate is. It’s assumed however that it only drops in the lv76-80 tier, which does severely limit your options for hunting them. This essentially restricts it to any Extra-Hard Emergency Quest featuring any of the Falzes and Super Hard Advance Quests at +12 risk or more, with Ruins being the one most likely to give you a Falz to fight. Data collected so far suggests the rate isn’t particularly good, which isn’t surprising. Austere weapons will take a long time to obtain as a result; at least a month assuming you manage to catch every instance of the quest. Those with multiple characters parked on multiple servers with enough friends to assist may get the weapon more quickly if they’re willing to transfer characters to pool their resources. The quest is limited to once per ship, not once per account. That isn’t an approach I recommend, but doubtlessly some of the richer players in more organised teams will be doing this. This isn’t the most unreasonable of grinds they’ve presented to us even if we assume that currently observed rates are the standard. When you clear the quest you may be given a number telling you which position you came in on your ship. It has absolutely no effect on your drops or your mission rewards, it’s purely for ego stroking and nothing else. It’s OK, we all like a good stroking now and then. So what about general drops? An average if running the quest with +250% and +100% boosters seems to be around 30 10*+ items. Pretty decent. It’s a pale shadow of the Excube pinata that is Magatsu but Double and the Profound Darkness can drop a much wider selection of weapons and has the largest pool of 13* weapons to pull from than any enemy in the game. 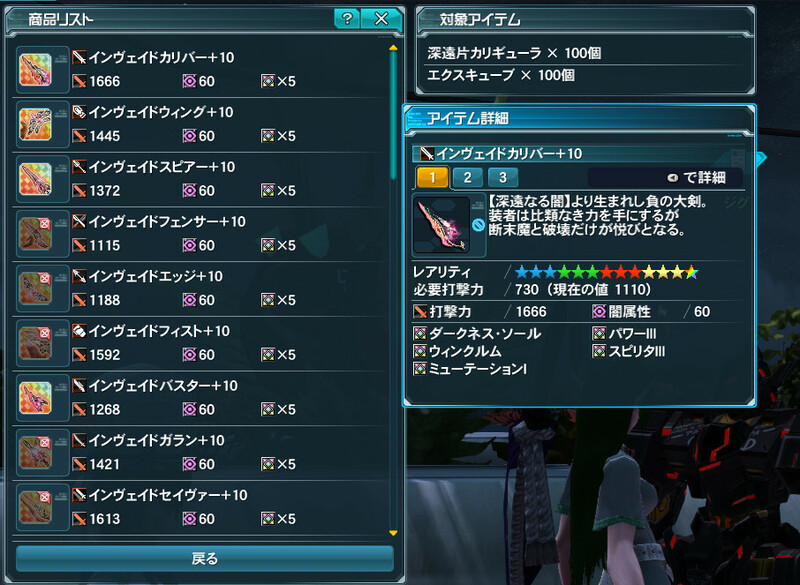 It seems to be able to drop any Dark Falz 13* weapon as well as significant 11*s from other bosses (including Gran Fol). It can also drop the Invade series weapons, which will significantly reduce the Caligula stone requirement should you get the type you want, it’s just an inventory space waster otherwise. What’s more, the boss can drop Austere weapons, allowing players to potentially skip this item grind entirely. So you go through the trouble of getting all those materials together, or maybe you’ve got some gear gaps to fill in and Invade weapons look promising, how good are they really? Invade weapons will only be +10, 60% with no potential if you purchase them from Zieg for 100 Caligula and 100 Excubes. Apparently they have a potential which boosts critical hit rate by 40% at level 3, which isn’t a terribly useful latent for most builds but it could be worse. Essentially if you’re hurting for gear, Invade weapons even with no latent could be an excellent stopgap, as they still provide a ton of attack power. At the rate discussed earlier, you should be guaranteed an Invade weapon after about 17 runs. Austere weapons however are the strongest weapons in the game right now. Their potential is 12% bonus damage with a 10% bonus to passive PP regeneration, which combined with their superior attack and the fact that their damage bonus is unconditional makes them stronger than Ares weapons. That said, they’re not a massive improvement over them, so those with finished Ares weapons might not really miss them. Surprisingly, this update added three new affixes, two of which we had no idea about. Creating these affixes requires some significant investment on the part of the player. Darkness Soul can simply be obtained from anything that drops from the Profound Darkness. Soul Catalyst and Astral Soul both need to be synthesized from other affixes however. To make a Soul Catalyst, you will need to combine any four of Elder Soul, Loser Soul, Double Soul, Apprentice Soul and Persona Soul. This will grant a 10% success rate for creating a Soul Catalyst. Yes you read that right, 10%. Once you manage to succeed with this, your job isn’t over yet, as if you want Astral Soul you’re going to need to use four Soul Catalysts together with a Darkness Soul in order to create Astral Soul. The transfer rate on Astral Soul currently isn’t known. That sure is a lot of gambling steps on top of a system that is already absolutely riddled with gambling steps! It’s a lot of work for +5 PP per item, but it is 20PP if you manage to get it on all of your units and your weapon. That’s a pretty significant amount, so min-maxers are likely going to want to go for it. For the rest of us, frankly it might be too much effort and you’ll be better off sticking to certain Ultimate souls instead. Hey! Related to the previous section, don’t fret about those abysmal transfer rates because if you’re willing to put up 100 Excubes for a 40% booster you can bring Soul Catalyst creation to a nifty 50%! More likely this is an item intended for regular affix synthesis to cover things that may cap out to less than 100% with the 30% booster. Given it’s 5 times as expensive as the 30% booster, it really isn’t worth using unless failing a 90% would incur a significant Meseta loss. There are certainly affixes out there that this is a genuine concern for (hello, Modulator). This was already a fair amount to go over so I’ll try to keep my thoughts brief. My other problem with this quest is that it’s the conclusion to the story. As such, to me it just feels kind of strange to have it confined to a quest that happens occasionally. If it was something that happened on a rotation both my main issues with the quest would be largely gone. That said, I do overall really enjoy the quest. It’s not particularly challenging, however it is fun in a lot of ways which for me makes up for the lack of difficulty. It’s visually very appealing and technically quite impressive for them, both of which make me eager to see what content they have in store for us down the line. It also feels like a satisfying way to end Episode 3, particularly with the story events that lead up to it which I also enjoyed even if I couldn’t understand them. Ignorance might well be bliss in this case, who knows… Roll on Episode 4, I say! Today’s the day! We finally get to stab er… I guess that’d be spoilers so I won’t say that yet. Play the story, you’ll see what I mean. Enjoy it. This is also the day we get a few new weapons and potentials. So how were the guesses in the previous post? [勇勢疾走] – Deal additional damage while HP is above 30% went to… Daggers of Serafi. Which additionally is a 13☆ weapon. [絶対破砕圏] – Deal 25/27/30% additional damage to enemies at close range went to… Adys Bunker! [清明なる加護 ] – Recover 30/35/40% additional PP on attack, regenerate PP 15/17/20% faster and deal 10/12/15% additional damage went to… God Hand! Shame I haven’t got one to sell. [幻精共鳴] – Increase the power of photon blasts and [滅壊の光刃] – Deal 21/23/25% additional damage to Darker Aberrations both went to… Coat Dublis, a 12☆ Double Saber similar to Persona’s. [廻転翔踏] – Reduces the PP costs of Grim Barrage and [????] reduces recast time on Chain after a successful Chain Finish depending on the chain count went to… Jack Wisp, a new 12☆ seasonal Twin Machinegun from Latan Rappy. “A bit off” barely covers it, they didn’t get a single one right! More importantly, Coat Doublis got both of the latents I guessed might go to the Austere series, so it’s OK I got egg on my face too. In this case I’m fairly happy to be wrong, but this new data does mean that the actual potential the Austere series will end up getting is a complete mystery. Nox Kuvel (12☆ Sword) – 堅甲錬陣 – A new Guard Stance latent. Don’t yet know the details. Thanks to EspioKaos and Mewn for help with translating things, this post would have basically not existed without them. Let me know if I got anything wrong. Author RaujinnPosted on October 14, 2015 October 15, 2015 Categories PSO2 NewsTags Potentials, PSO2 Related Sites, Weapons2 Comments on Potentials Time! Just a short post having a ponder about the new latents discovered in the latest pre-patch data. First impression is that a number of them certainly appear to be similar to the Photon-Booster potentials that are already out, suggesting that some of these will be going to Dark Falz weapons. If I were to guess, I’d say 5, 8, 9 and 10 are the Photon Booster latents. This leaves us to speculated about the rest, which is especially relevant given a certain weapon series is coming up; the Austere series. There is a worry that they could end up with latent 1 or 6, making their hefty material cost a lot more off-putting. If it got 6, it’d be strange given the materials require playing multiple areas of the game, making such a restricted potential feel kind of inappropriate. Right now, it’s too early to say for sure as not only is data-mined content not really confirmation of anything we also can’t rule a fair number of the other latents out yet. Also what the heck is up with number 7 there? An inverse racial potential? Notably its labelled as “DamageBonusRaceUlt4_1” which may suggest it has something to do with the as-yet unannounced Ultimate Amduscia. If it is a latent associated with the inevitable 13* weapon series to be released with that quest, then they could potentially be the strongest series yet as long as your target isn’t a dragon! Reduces recast time on Chain after a successful Chain Finish depending on the chain count. Bardiche -> Unknown. It’s one of the latents that doesn’t appear to be listed. Grigoros -> Unknown. Again, one of the latents that doesn’t appear to be listed. I think I’ve gotten that correct. I only list these for curiousity’s sake. I’m not really sold on any of their guesses. They seem to include some Magatsu weapons in this list, which is fine however it doesn’t take into account that we’re going to be getting a new selection of the Nox-series weapons. We’ll know for sure in a few days, so let’s see how right this random post on the internet turns out to be because I have nothing better to do I guess. Let me know if I’ve gotten anything wrong in this post, thanks. As the title says, a class re-balance is on its way and it will be arriving on the 14th. We’ve known for a while that Gunner and Braver were getting tweaked but the finer details weren’t revealed until today. It seems that they’re not the only classes to be getting some adjustments, as others will be too. Let’s go over them, shall we? High Time will gain its attack boost more quickly than it does now. Normal attacks will make you start to fall later than it does now. You will be able to change your facing during Sattelite Aim. Shift Period will be sped up and deal more damage. The time when you start to fall will be pushed back. Aerial Shooting, Dead Approach, Messiah Time, Elder Rebellion, Reverse Tap and Heel Stab will be adjusted at a later date. Being able to change direction during Satellite Aim is more a convenience change than a buff, but a pretty welcome one. It’s also nice to know that invincibility frames won’t be lost in light of the sped up Stylish Roll, making this change an overall buff in my opinion. Shift Period could arguably have crafted Bullet Squall as its main competition, currently. The area of effect of Shift Period is much higher though, so with its increased speed and damage it may have a use if it doesn’t currently. If it isn’t the case already, I feel like the wider reach of Shift Period would help a lot with Gunner’s mobbing capabilities. I am surprised to see that Infinite Fire won’t be seeing any adjustment, given how under-used a Photon Art it seems to be currently. It’s a fair shot more obscure than it was back in Stylish Roll Just-Attack Up’s meta days at least! Sonic Arrow will have faster Just-Attack timing and grant more points towards the Gear Gauge. The time when you start to fall from mid-air will be adjusted too. Sacrifice Bite: Parts of the attack will be faster and it will also contribute more points towards the Gear-Gauge. Something to help sword-users stay mid-air I guess. The boosts to Gear-Gauge acquisition rate are always welcome for Sword seeing as its arguably the most dependent weapon in the game on it. This is likely to be more helpful to Fi/Hu or other x/Hu combinations using swords, as they don’t have access to Fury Gear boost. Weak Bullet something about making it easier to land it? One Point: Damage will be increased and PP consumption reduced. Sneak Shooter: Just-Attack timing will be adjusted and the bullet sped up. Diffuse Shell and Parallel Slider will be adjusted at a later date. Sneak Shooter was always kind of rough to hit anything with it due to the slow bullet, so that;s a welcome change at least. The weak bullet changes are harder to pin down, it may be a faster bullet or there may be other changes that make it easier to land it, not sure. Double Saber shift action will have its Just-Attack timing adjusted and its cancel timing sped up. Quick March will have its damage increased and its cancel timing sped up. It will also stun enemies instead of launching them. Surprise Dunk will have its damage increased and its hit-stop reduced. The enemy will also be launched slightly by the hit instead of stunned. Deadly Archer will have the timing between each hit adjusted? Orchestra, Illusion Rave and Acro Effect will be adjusted at a later date. Rapid Shoot will no longer have a “wind-up” time. Stance Critical and Stance Charge have had their places on the skill tree adjusted. You no longer need to put points in Critical to take on Charge. Sakura Endo will be faster, have its JA timing reduced and have its non-charged damage boosted. Million Storm will have its damage increased and its PP cost reduced. The changes to the skill tree are mostly good, freeing up SP to support more hybridized builds than is currently possible, I’m not sure you’ll be able to max out both Katana and Bulletbow trees while also having a stance still, but having access to more than half the class at a given time will be nice. The buffs to Torrential Arrow and Million Storm could be an attempt to improve the mobbing capabilities of Bullet Bows, which is something they do need assistance with definitely. They’re already great bossing weapons. Jet Boots Escape will now apply to the shift-action of regular attacks. providing invulnerability during it. Another attempt to make Gunslashes viable weapons. Good luck, developers and bless you for trying I guess. Of course, this change will come with free Skill-Tree Reset Passes for all. Please let me know if there are any inaccuracies in this post. PSO2Blog Create a free website or blog at WordPress.com.